Silkie feathers have no hook or barb between the flags of the feathers. The lack of hooks or barbs is known as silkied, and is expressed with the genetic symbol "h". Normal feathers, with barbs are denoted by the symbol "H". The h state of feather is a recessive condition, so two h genes are required for expression. The normal feather can be represented by HH or Hh, while the silkied feather is represented by hh. There is very little known on the genetics of silkie eye colour. The E-allele causes dark, brown eyes, while skin and feather melanizing factors also contribute to eye colour. The classic earlobe colour of turquoise is attributed to the presence of Fm, the gene which causes the black skin colour in silkies. Fm or fybromelanosis is a dominant autosomal gene. However, it requires the presence of inhibitor of dermal melanin, id+, to be expressed. This is the wild form of the gene (indicated by the +). The id+ gene is sexlinked, which is why you can get roosters with greater expression of red in their combs and wattles rather than hens. However, it does depend on which parent is carrying the dominant gene. To confuse things further, some feather colours affect the expression of Fm as well. These include buff, lemon and cuckoo silkies. In buff and lemon silkies the gene inhibiting Fm is Di. 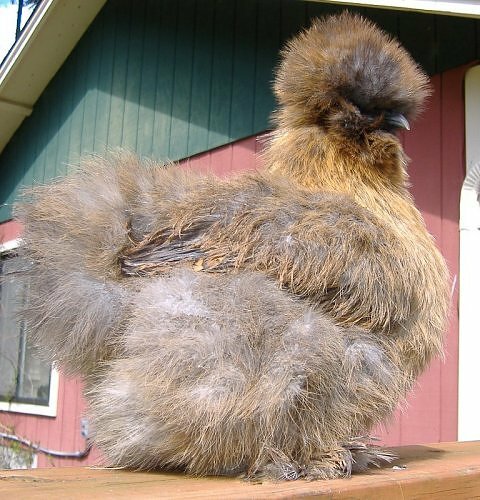 Silkies should have a roundish comb, preferrably wider than its high. Depending on where you are in the world and the genetics of the bird, it may have a rose comb or a walnut comb. The main type of silkie comb is a walnut comb, represented by R/R P/P, a combination of the rose (R) and pea (P) combs. Silkies can have a beard and associated muffs. This is brought about by the presence of the Muff Beard gene Mb. It is an incompletely dominant gene. A side effect of the presence of Mb is a reduced wattle size. Very rarely this gene is associated with crossed beaks. The crest of silkies is associated with a vaulted skull. According to "Silkies and Silke Bantams" by Sigrid Van Hort, the vaulted skill is associated with larger brains, and enlarged optic tract, sound orientation areas of the head is enlarged and the auditory tracts and vocal centres are also enlarged. 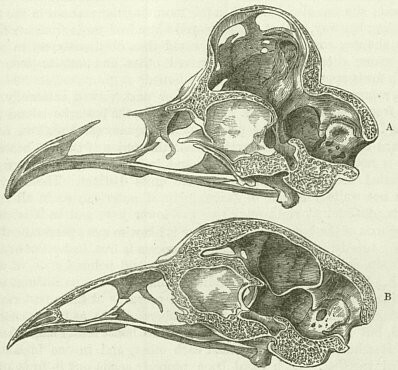 In the diagram above, "A" shows a vaulted skull, whereas "B" shows a normal skull. The crest is believed to be based on one gene Cr, but this is still being investigated. As can be seen from its capital letter denotion, Cr or crest is an autosomal incompletely dominant gene to no crest. 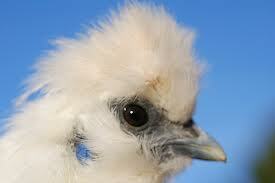 Male silkies differ from other crested breeds in the presence of streamers which flow down the back of the neck. It is important that the crest DOES NOT obscure the vision of the fowl.